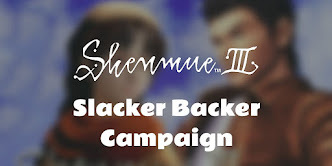 In Part One of this topic, we considered which part of Yokosuka is most likely to have served as the real-life inspiration for the harbor and warehouse area that Ryo visits in Shenmue. The placenames used in the game - New Yokosuka Harbor in Amihama - do not exist in real life. 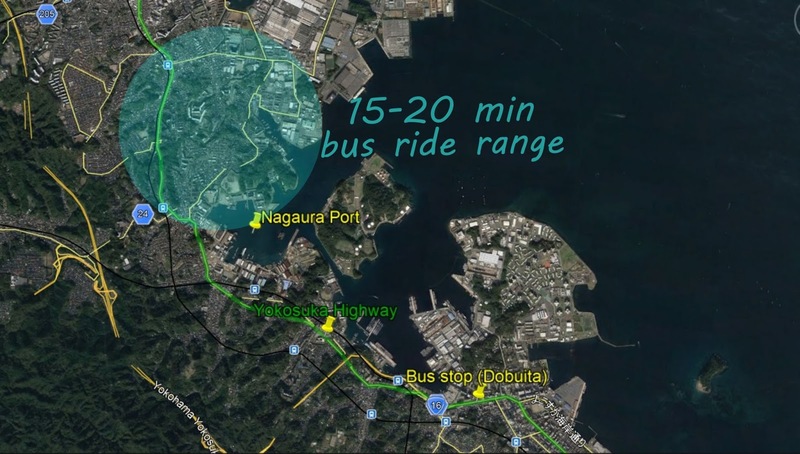 Based on the clues gathered, the location that appeared to be the best fit was an area of the harbor that lies 15-20 minutes away from Dobuita, called Nagaura Port. But in fact, we have not yet exhausted all possible sources of clues. In this second article, we will carry out an in-depth analysis of the road signboards that Ryo passes on his motorbike on the way to the harbor. We will try plotting the placenames shown onto a real map (if they exist), to see if this helps to provide a confirmation of Amihama's location. 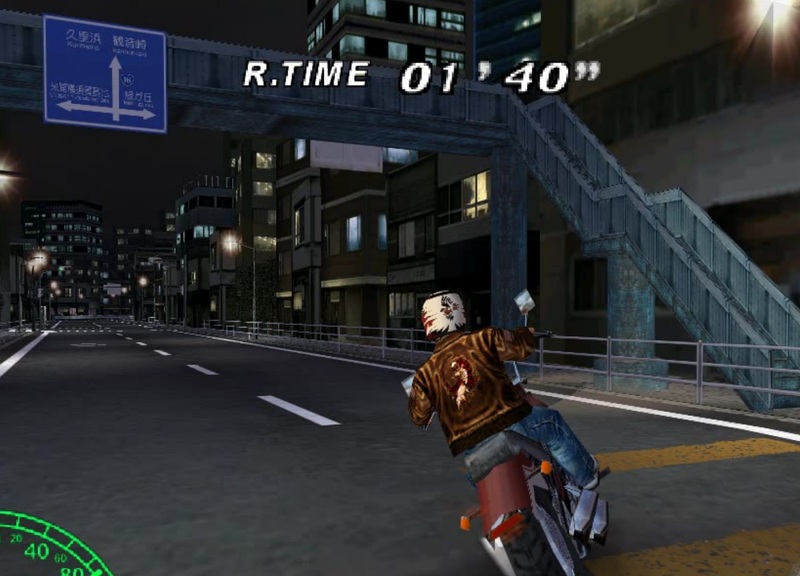 During Ryo's motorcycle ride to the harbor (at high speed) and back again (at a more leisurely pace), players will notice the blue-and-white route signs passing by overhead. These signs flash past rapidly during the in-game sequence, and are virtually impossible to read properly under such conditions. The fast-paced ride to the harbor makes trying to decipher the route information signs on the fly a difficult task. The three route information signs Ryo passes. The signs closely mimic those found on Japanese roads in appearance, and while they are not exact replicas of existing signs in the real Yokosuka, the placenames can be recognized as referring to real places. The in-game sign shows two areas, Kurihama and Kannonsaki, lying straight ahead on Route 16. The road to the left leads to the U.S. NAVY Yokosuka Base Camp and the road to the right, Midori ga oka. Sign #1: in-game image (left) and the placenames marked on a map (right). Kurihama is the name of a seaside area and Kannonzaki (note that the game spells this with an "s" rather than a "z") is the name of a peninsula. Both lie southeast of Yokosuka. Route 16 (marked in blue) is the main coastal highway that runs through Yokosuka, also known simply as the Yokosuka Highway. The US Navy Base is located at the harbor near Dobuita to the north. Midori ga oka is the name of a suburb that is directly south of Dobuita. Based on the relative positioning of the placenames, this sign describes an intersection somewhere on the Yokosuka Highway very close to Dobuita. The rider would be heading towards the southeast, a direction that leads away from Nagaura. This would appear to counter the hypothesis that Ryo rides in the direction of Nagaura Port from Dobuita. This is an unexpected finding, but for now we'll make a mental note and move on to the next sign. Sign #2: in-game image (left) and the placenames marked on a map (right). Yokohama city is about an hour north of Yokosuka by train, and can be reached by car by following Route 16. The Yokohama-Yokosuka Road (marked in yellow) is an inland highway that runs from the far end of Yokosuka up to Yokohama. Yokosuka harbor (also called Yokosuka Port) covers a wide section of the Yokosuka coast. This sign has the rider heading in the opposite direction to the first, namely towards Yokohama, to the north. And there is something wrong with the ordering of the placenames to the left and right; they are swapped around compared to their actual positions on a map. When heading towards Yokohama, the harbor lies to one's right, not one's left. On the third sign, positioned straight ahead are Nagaura and Yokohama. To the left is the Honcho-Yamanaka Road and to the right is Yokosuka station. Sign #3: in-game image (left) and the placenames marked on a map (right). Nagaura is the name of an area in Yokosuka that lies on the way to Yokohama city along Route 16, and is where Nagura Port is situated. Yokosuka station is a train station on the JR line that is a short walk from Dobuita. The Honcho-Yamanaka Road is marked in pink on the map, and is a toll road that connects the coastal Yokosuka Highway (shown in blue) to the inland Yokohama-Yokosuka Road (shown in yellow). Here we have encountered a mention of Nagaura in the game itself! This third sign is the last one that Ryo passes beneath when he rides to the harbor area, and it is likely not coincidental that Nagaura is shown as his destination. Overall, the three signs lack directional consistency: the first would have Ryo riding south; the second has him riding north but with the side-road destinations that one would see if riding in the opposite direction; while only the third one is entirely correct for a rider heading north. The inconsistencies may have a logical explanation, however. After looking into what signs are shown in the cut-scene for when Ryo is traveling away from the harbor and back to Dobuita with Nozomi, it turns out that exactly the same signs appear - they are reused! For the reverse journey, the first sign now makes sense, as it fits the case for a rider heading towards Dobuita. The three signs have in fact been cleverly designed so that they have some elements that are correct for either direction, while the compromise is that they are not entirely correct for either. So, while the signs do not allow the route to the harbor to be determined as clearly as I had hoped, the appearance of Nagaura on the sign just before Ryo reaches the harbor may be more than coincidental. 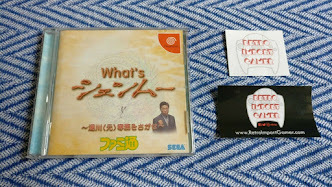 A final possible hint at Amihama's inspiration can be found in the NHK "Making Of Shenmue" Documentary that was broadcast on the BS2 satellite TV channel in Japan in 1999. At one point, we are shown several satellite photos pinned up at the development studio (things were so much more manual in the days before Google Earth!). Several sticky notes are attached, although the text on them is not legible. The photos cover the broad Yokosuka harbor area. 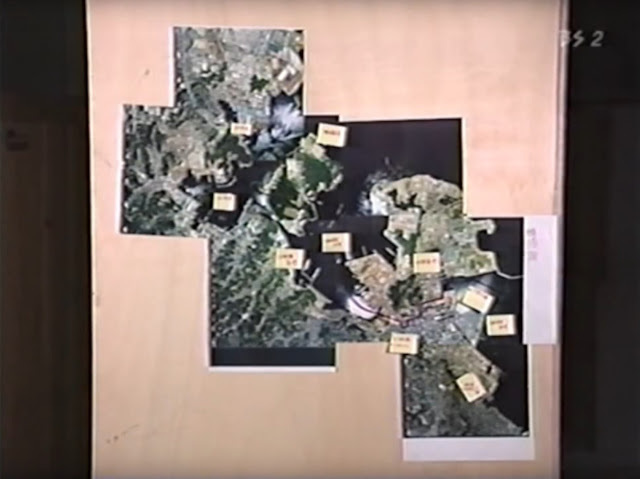 Screen grab from the Making Of documentary: satellite images. This is in fact an aerial view of Nagaura Port itself. The documentary does not make any specific comment about this photo, but it can be assumed this is one of the areas the development team was particularly interested in, bolstering the case for its use as the harbor location. 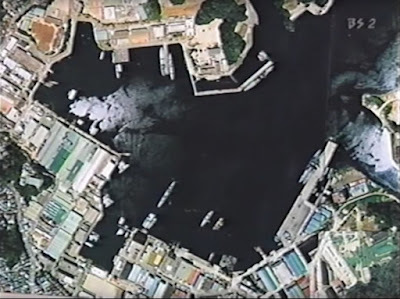 Appearance of a satellite photo of Nagaura Port in the Making Of Shenmue documentary. 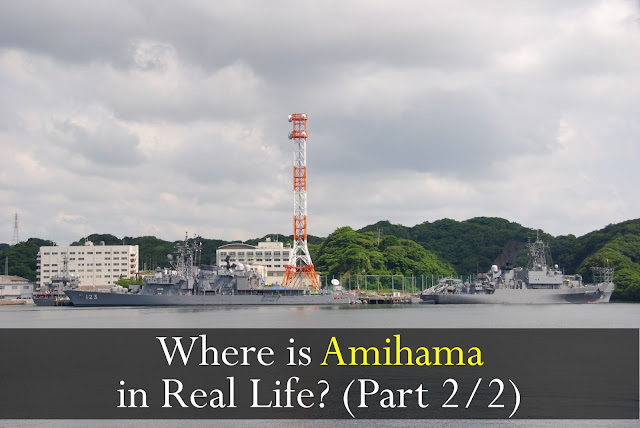 Some may be more of a stretch than others, but together they form a compelling case that suggest Amihama may be based on real-life Nagaura Port. When I first studied the geographical layout of Yokosuka, I assumed that the game's Amihama was based directly on the harbor area around the US Navy Base that lies across the road from Dobuita. However, I always wondered why the game has Ryo taking a bus or motorcycle to get there. Once the alternative location of Nagaura Port is brought into the picture, this discrepancy is resolved. I am personally quite in awe at the level of realism that Yu Suzuki and team retained when comparing to actual geography, even if some compromises were made. 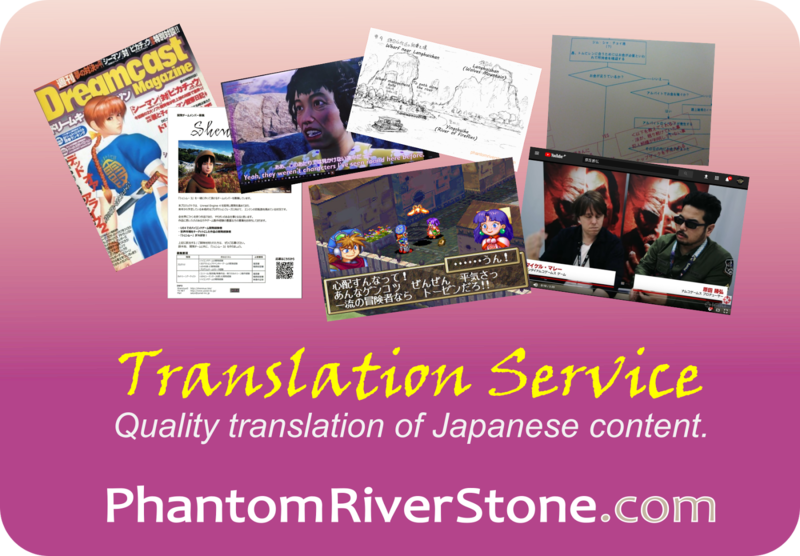 In the near future, we will be making a start on translating parts of the Shenmue "Sacred Spot" guide map (unless the promised English version is published first!) - and there is no better place to start than to see what it has to say about Ryo's harbor route.